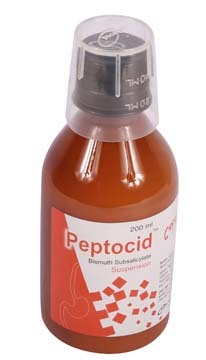 Peptocid Suspension: Each 30 ml contains 525.6 mg Bismuth Subsalicylate BP. Antacid action: Peptocid coats ulcer surface, protecting it from acid and pepsin. It stimulates mucus and bicarbonate secretion and also reacts with HCl, producing bismuth oxychloride and salicylic acid. Thus it reduces HCl. Anti-diarrheal action: Bismuth Subsalicylate stimulates absorption of water and electrolytes across the intestinal wall. In infectious diarrhea it binds with toxin produced by E.coli and disrupts cell, causing lysis of H.pylori and prevents adhesion of H.pylori in the cell wall of intestine. Anti-inflammatory action: Salicylic acid from hydrolyzed Bismuth Subsalicylate inhibits prostaglandin G/H synthase. Thus reduces inflammation and coats irritated tissue to retard the expulsion of fluid. Peptocid is indicated for indigestion, gastric fullness, bloating, belching, growling stomach, sour stomach and diarrhea. 12 years and above: 30 ml at a time. Dose can be repeated after 1-2 hours if necessary. Daily maximum intake should not exceed 8 doses. Less than 12 years: Please contact with physician. Black stool and black tongue are common with use of Peptocid. Peptocid should not be used if black stool and black tongue are severe or persist for more than 2 days. Do not take with aspirin or other salicylates. Caution should be exercised by patients taking medicines for anti-coagulation, diabetes or gout. For elderly patients suffering from renal insufficiency, caution should be taken. There are no adequate data concerning the use of Peptocid in pregnant women. Peptocid should be avoided during pregnancy and lactation.